Secretary of State Hillary Clinton has posted real life "Texts from Hillary," her response to a blog that features fictional texts from Clinton to various famous people. 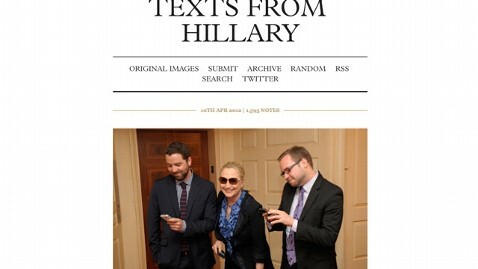 The Tumblr blog Texts From Hillary paired pictures of famous people (everyone from Mark Zuckerberg to Oprah) using their phones with a shot of Clinton reading a blackberry and wondered at amusing things they could be texting about. And Clinton's texts to the site today, a back and forth with the men responsible for the site, Stacy Lambe and Adam Smith, was a humorous attempt to become a willing part of the joke. "OMG Busted," Smith replies in the image. "sry Hillz," Lambe texted back. The bottom of the exchange reads, "A submission from Secretary Hillary Clinton." As proof that the entry came from the secretary herself, Smith and Lambe posted a picture of her today in sunglasses, laughing with them, as she stood next to the duo holding their cell phones. According to Lambe and Smith, the secretary's office reached out to them to say she approved of their faux tumbler blog, and wanted to coordinate a response. The entry probably can be considered Clinton's official response to the Tumbler blog - until she posted it, she had declined to issue an official comment, despite repeated requests from the media, including ABC News. For those wondering what the reference to "Scrunchie time" is from, Elle magazine recently published a lengthy profile of Clinton in which one of her staff talks to the magazine about the secretary's no-nonsense fashion style, and says some of the staff want to ban her from using her 90's ponytail holder, which the Secretary prefers because it keeps her hair neat and out of her face. At last night's Aung San Suu Kyi biopic screening event in Washington, D.C., Clinton wore her hair in a ponytail held by what looked like a bedazzled… scrunchie.